The Rolls-Royce Cullinan is Rolls-Royce as it’s never been seen before. 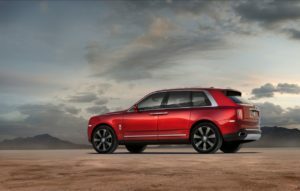 The Cullinan, announced for launch three years ago, delivers customers “The Rolls-Royce of SUVs”, with luxury, performance and usability not seen before in the SUV market. With a new, younger and more adventurous customer Rolls-Royce has created a vehicle that is “Effortless, Everywhere”, enabling drivers and passengers to venture completely off the beaten track and rewarding them with life’s most enriching experiences. For the first time the car has an opening tailgate, called ‘The Clasp’. In a nod to the era when occupants did not travel with their belongings, the rear profile of Cullinan is a two-part, ‘D-Back’ format that alludes to the ‘three-box’ design of the vehicle, with the bustle denoting the place of the luggage. ‘The Clasp’ opens and closes in its two sections automatically at the touch of the key fob button. The rear passenger compartment of Cullinan has been designed to offer the best seat in the house for the owner’s particular needs. Two rear configurations are offered – Lounge Seats or Individual seats. The Lounge Seat configuration is the more functional of the two options. With space for three passengers in the rear, seats also fold down – a first for Rolls-Royce. For those who intend to transport large items back from their adventures, the rear of Cullinan offers a large amount of space. 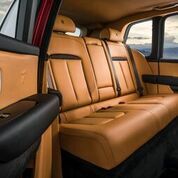 A second rear configuration is offered with the Cullinan: The Individual Seat configuration is for those who value the ultimate luxury an SUV can offer over practicality. The two individual rear seats are separated by a Fixed Rear Centre Console incorporating a drinks cabinet with Rolls-Royce whisky glasses and decanter, champagne flutes and refrigerator. Rolls-Royce Cullinan is the most technologically advanced car of its type in the world. Further equipment includes: Night Vision and Vision Assist including daytime and night-time Wildlife & Pedestrian warning; Alertness Assistant; a 4-Camera system with Panoramic View, all-round visibility and helicopter view; Active Cruise Control; Collision Warning; Cross-Traffic Warning, Lane Departure and Lane Change Warning; an industry leading 7×3 High-Resolution Head-Up Display, WiFi hotspot, and of course the latest Navigation and Entertainment Systems. After stepping into the cabin, driver and passengers press the door closing button to seal themselves in. On touching the sensor on the exterior door handles the doors automatically close. 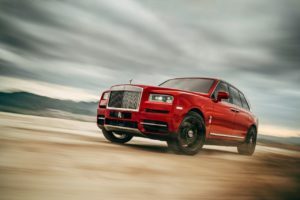 A touch of the start button then elevates Cullinan 40mm to its standard, commanding ride height, placing its occupants in the perfect position from which to see the world as it drives off. The driver can use the off-road setting to glide over any situation, whether it be rough track, gravel, wet grass, mud, snow or sand delivering all 850Nm of torque to all four wheels without interruption. And faced with deep snow, sand or the need to ford streams, Cullinan delivers the deepest wading depth of any super-luxury SUV at 540mm thanks to its highest ride height.